PokerTH is a simulation and engine of poker game that is free and open source. 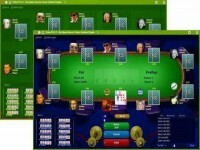 You can play poker offline against the computer, or play with your friends in LAN network, or even play online. There is also a chat feature while playing. This game gives you good control on game inteface including style, sound, game settings, and avatars of players. Play a domino game in the Jamaican style! Have fun with 30 great solitaire card games for free. Enjoy playing dominoes against computer opponent.